If you’re familiar with NFL betting at all, you know that the most popular way to bet is on the point spread. The point spread handicaps the game, making it more fun to watch (and bet on). The money line is also a fun way to wager on football, offering odds based on the strength of each team. There are several other ways to bet on football as well. Below is a rundown. For those of you looking for the best sites to wager on NFL, then you can skip right there by clicking this link. NFL is the most watched sport in the USA. With cheerleaders like these it’s no surprise! As mentioned above, most NFL bets are made on the point spread. A point spread gives points to the underdog, and takes them from the favorite. This makes games more competitive, and thus the betting is more competitive as well. In this game, the Green Bay Packers are favored by 4.5 points. For bets on them to win, the Packers would need to win by 5 or more points. For example, if the Packers won the game 27-24, 4.5 points need to be removed from their score, making it a 22.5-24 loss. If the Packers win 30-24, then the adjusted score would be 25.5-24, which means that bets on them would win. If you’ve bet on the Bears, you get to add 4.5 points to their score. So, a 27-24 Packers win would result in an adjusted score of 27-28.5, which means that bets on the Bears would win. Fans here in the US love to bet on NFLs 32 teams. The Superbowl is the most bet sporting event in the USA. In money line bets, no point spread is used. The game is straight-up, based on the actual score of the game. If the Packers beat the Bears, bets on Packers win. If the Bears win, bets on them win. Since no point spread is used, odds are adjusted based on the strength of each team. This means that bettors have to risk more to win less on the favored team, and bet less to win more on the underdog. Favorites and underdogs are reflected by the type of money line they have – either negative or positive. Negative and positive money lines use American odds as a standard, but they can also be viewed in decimal or fractional at most online sportsbooks. If you’re more familiar with decimal or fractional odds, look for a button that allows you to convert them into your preferred odds format when you visit an online sportsbook. Money line odds are calculated using $100 as a basis point. However, the payouts are calculated differently for negative and positive money lines. The minus sign (-) tells us the Steelers are the favorite. ‘230’ represents the amount that a bettor would have to wager in order to win $100 in profit. In this case, a punter would have to bet $230 to win $100 in profit, for a total return of $330. The plus sign (+) tells us the Ravens are the underdog. ‘190’ is the profit that would be won from a $100 wager, for a total return of $290. In this case, the Patriots are a slight favorite. A bettor would need to wager $115 to win $100 on the Patriots, or $105 to win $100 on the Colts. For betting on the favorite, the benefit of the money line is that a bettor doesn’t have to give up any points. They just need to win, the number of points they win by makes no difference. The downside is that the odds will be lower, offering less potential profit on a winning bet. For bets on the underdog, the benefit is the increased odds a punter can get. Instead of getting -110 on the spread, punters can get much greater odds. The downside is that the underdog isn’t given any points, so they have to win the game. NFL total bets (also called over/under), are the same as they are for basketball, baseball, and other sports that use points to determine a winner. They are simple bets on the total, combined number of points that both teams will score. So, if a game has a final score of 24-14, the total is 38. If the score is 31-17, the total is 48. In this case, a bettor needs to determine if the teams will score 38 or more points, or 37 or fewer. If you think they’ll score 38 or more, you would bet the over. If you think they’ll score 37 or fewer points, you would bet the under. It’s like betting on red or black at an online roulette game. Most online sportsbooks offer total bets with -110 on either side, although this can vary based on the betting action. For example, it’s common to find -105 on one side, and -115 on the opposite side. If you can consistently pick winning total bets, then you’re either very lucky or very good. While the over/under’s usually adjust a bit as people make their bets, these are a coin-flip (minus the juice) for most handicappers. Since that’s true for most of us, you can actually do better by betting on red or black on roulette, as mentioned above. The reason is because you’ll usually pay 10% vig on an over/under bet, but only 5.26% on American roulette (based on 0 and 00 on a 36-number roulette wheel). Occasionally -105 (5% vig) can be found on total bets, usually during a special promotion that online sportsbooks might be offering. Prop bets (proposition bets), can be wagers on all sorts of things that might happen during a game. In the NFL, there are team & player props available, and the variety is almost endless. The best online sportsbooks typically offer a fair number of prop bets before games begin. Others offer live betting as well, with dozens or even hundreds of props as the game is being played. Will the first score be a touchdown, field goal, or safety? Will quarterback X throw for over or under 300 yards? Will runningback Y rush for over 100 yards? Will the current possession result in a 1st down? This is just the beginning or the prop bets that can be found. If you can think of it, it can probably be bet on. Massive brand who offer a great choice of NFL betting options as well as poker, casino, bingo and more. For the NFL, futures bets are wagers picking the winner of a division, conference, or the Super Bowl Champion. Every online sportsbook offers NFL futures bets, but the key is to shop around and find the best odds on the team (s) you want to bet on. You might get 12/1 on a team at one sportsbook, and find 15/1 somewhere else. So, if you take your NFL betting seriously, you need to have accounts at several online sportsbooks and compare odds. Many online bookmakers offer NFL futures bets just days or weeks after the prior season has ended. Placing early futures bets can be good or bad for punters, based on moves that teams make during the off-season. For example, you might get 30/1 odds on a team that finished 8-8 in the prior season, not knowing what they’ll do in the off-season. If they make a few big trades or free agent acquisitions, the odds on them will likely go down – good for those that got their bets in early. However, if you pick a team that went 10-6 in the prior season, then the team loses a couple of star players during the off-season, the odds might become greater. If you had placed this bet early you might’ve gotten 10/1 odds on them, and find them at 16/1 as the season gets closer. While this isn’t always the case, it’s usually better to make bets on favorites closer to the start of the season, when all of their player moves have been made. If you’re expecting an underdog to make some big moves and win their division (or conference or Super Bowl), you’ll usually be better off placing your bets early. If they don’t make major changes to their roster, their odds will usually stay about the same. However, if you were right and the team makes some big moves, you can lock in greater odds early. 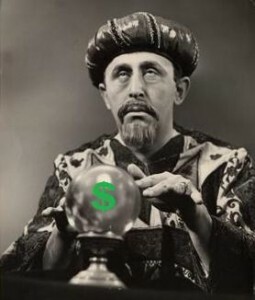 The main negative to futures bets is that they take all season long until they pay out. If you make your NFL futures bets in June, you usually won’t get paid out until January or February. The sportsbook has held onto your money the entire time, when you could’ve used it to make several other bets along the way. There are more futures bets made on the Super Bowl than any other single game in the world. Billions of dollars are bet on this game every year, at live or online sportsbooks, and between friends or co-workers. Most of the betting is done by casual bettors – fans of NFL football. Handicappers that are good at predicting line movement have an advantage, knowing the correct timing to place their bet. Value can often be found by getting bets in very early, just as the odds get posted. The same can be said about betting very late, within a couple hours of game-time. During the middle period is when most of the betting action occurs, and most of that comes from casual bettors looking to have some fun. Early and late bets are often made by sharps, looking to take advantage of improved odds on one side or the other. Live betting is becoming more and more popular every year. These are bets that can be made during a game, while it’s being played. Handicappers can bet on every possession, and almost every down. The selection of live bets that can be made is astounding, literally hundreds per game. Punters can bet on the next play being a pass or rush, if it will result in a 1st down or not, or a huge variety of other things as well. Betting on a game while it’s being played can add a lot of excitement to a game. Being able to do it from your mobile device while you sit in the stands is even more exciting. If you didn’t know you could be placing bets on your mobile phone, you’ve been missing out. No longer do we have to hunt down our bookie, drive to the casino, or even have our computer in front of us. Now, many online bookmakers offer mobile betting from an iPad, iPhone, Blackberry, Android, or Windows based mobile devices. If your phone has internet capabilities, you can place bets with it. For US bettors, the best way to place mobile bets is at Bovada.lv (their sports betting app for smartphones is pictured to the right). To do this, first you need to register your new account online, from your computer. Once you’ve registered your new account, go to the cashier window to fund the account ($35 minimum). 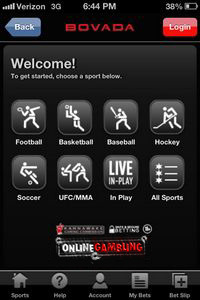 Then, go to Bovada.lv on your mobile device and log into your account. Now you’re ready to place mobile bets. As possibly the largest sport to bet on internationally, every online bookmaker offers NFL betting. A lot of exotic bets are offered for NFL football as well, making it a fun sport for casual punters. At many online betting sites, divisional, conference, and Super Bowl futures bets are available almost as soon as the previous season has ended. Casual & small stakes NFL punters will be happy betting at a number of online bookmakers. Professional and high stakes cappers need to be more selective, with funded accounts at several of the best betting sites. Professional punters need to shop for the best prices on every wager – the lowest vig and greatest odds they can find. This is half the battle for becoming a winning punter.